Horizon Zero Dawn (game, 2017). An action role-playing video game by Sony Interactive Entertainment/SCEA. Developed by Guerrilla Games. Official Trailer. Horizon Zero Dawn is an action role-playing video game by Sony Interactive Entertainment and SCEA, developed by Guerrilla Games. Horizon Zero Dawn - Story Trailer | PS4. The story is set in the 31st century, in a world where humans have regressed to primitive tribal societies as a result of some unspecified calamity. Their technologically advanced predecessors are vaguely remembered as the "Old Ones." Large robotic creatures known merely as "machines" now dominate the Earth. For the most part, they peacefully coexist with humans, who occasionally hunt them for parts. However, a phenomenon known as the "Derangement" has caused machines to become more aggressive towards humans, and larger and deadlier machines have begun to appear. There are three tribes that are prominently featured: the Nora, the Carja, and the Oseram. The Nora are fierce hunter-gatherers who live in the mountains and worship nature as the "All-Mother." The Carja are desert-dwelling city builders who worship the Sun. The Oseram are tinkerers known for their metalworking, brewing, and arguing. Aloy was cast out from the Nora tribe at birth, raised by an outcast named Rost (JB Blanc). As a child, she obtained a Focus, a small augmented reality device that gives her special perceptive abilities. After coming of age, Aloy (Ashly Burch) enters a competition called the Proving to win the right to become a Nora Brave, and by extension, a member of the Nora tribe. Aloy wins the competition, but the Nora are suddenly attacked by cultists. Aloy is almost killed by their leader Helis (Crispin Freeman), but is saved by Rost, who sacrifices himself to save her. When Aloy awakes, a Matriarch explains that the cultists had gained control of corrupted machines. Aloy also learns that as an infant, she was found at the foot of a sealed door. Oseram foreigner Olin (Chook Sibtain) informs Aloy that the cultists are part of a group called the Eclipse, and indicates that Aloy was targeted due to her resemblance to an Old World scientist named Dr. Elisabet Sobeck (also voiced by Burch). 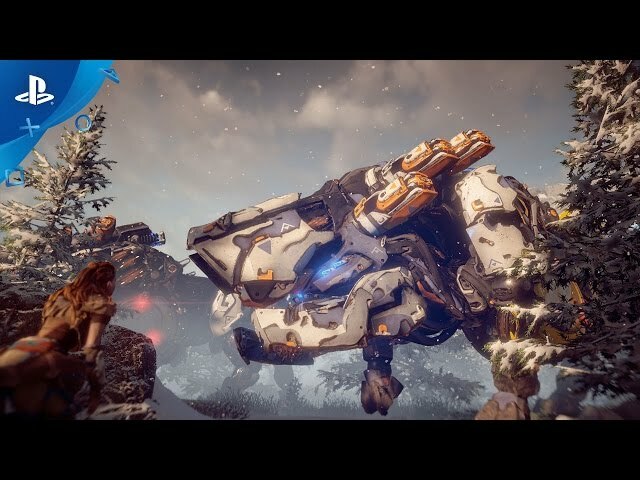 Aloy locates the remnants of the company Faro Automated Solutions and discovers that the old world was destroyed nearly 1,000 years ago after Faro lost control of its automated "peacekeeper" military robots. The robots, which could self-replicate and consumed biomass as fuel, overran the planet and consumed the biosphere, stripping Earth of all life. Project Zero Dawn, a top secret project spearheaded by Dr. Sobeck, was a plan to create an automated terraforming system to eventually shut the robots down and restore life to Earth. Horizon Zero Dawn is an action role-playing game played from a third-person perspective. 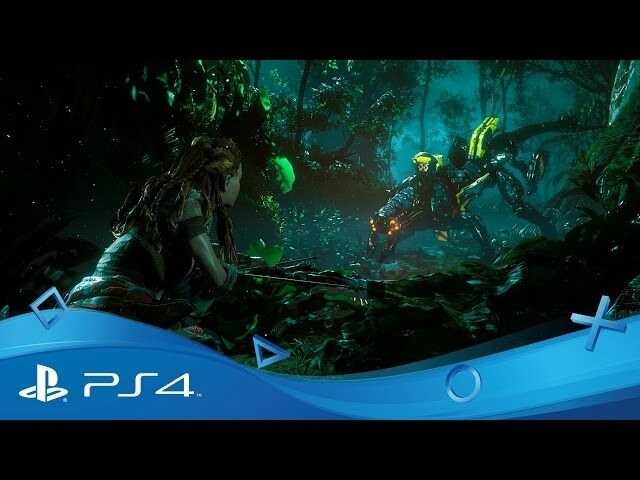 Players take control of Aloy, a hunter and archer, as she ventures through a post-apocalyptic land ruled by robotic creatures known simply as "machines". Aloy can kill enemies in a variety of ways, such as by setting traps like tripwires using the Tripcaster, shooting them with arrows, using explosives, and using a spear. Machine components, including electricity and the metal they are composed of, are vital to Aloy's survival, and she can loot their corpses to find useful resources for crafting. Ammo, resource satchels, pouches, quivers; resistance, antidotes, health potions, and traps are all amenable to crafting. Weapons have modification slots for dealing more damage. A small head piece that Aloy wears called a Focus allows her to scan machines to determine their susceptibilities, identify their location, the particular level they possess, and the nature of loot they will drop. One machine, the Stalker, can enable cloaking technology as a means of averting the gaze of Aloy's Focus scan. Machines attack by way of defensive and offensive measures, and will in either case react to a perceived threat by charging at it with brute force or projectiles. As they exhibit the behaviour of wild animals, some machines are inclined to move in herds and others, possessing the ability of flight, do so in flocks. Unless hacked with the Override Tool, machines will not exert aggressive force against each other. Aloy also engages in battle with members of the cult known as the Eclipse, who are occasionally flanked by corrupted machines. Aloy may dodge, sprint, slide, or roll to evade her enemies' advances. Horizon Zero Dawn was scheduled to be released by Sony Interactive Entertainment and SCEA on February 28, 2017 (North America) and on March 1, 2017 (PAL region). The game is made with Decima engine.